Hello everyone! How’re y’all doing? For some odd reason accents writings are sort of painful to type down. But I digress. I just wanted to talk to you guys about #18 on my 20 things before 20 list. Hello everyone! So being honest I have been uninspired to blog lately. As you can tell from the 3 week disappearance of myself. And yes, I miss blogging but 3 weeks ago it felt like I had an obligation to blog but now I just want to get back into it. New fall collections to think about and Holiday items are being released as well. But just an update that I am putting up posts again. I think my summer vacation is over now. ^-^ School begins on Tues Sept 6! Eeeeek!! 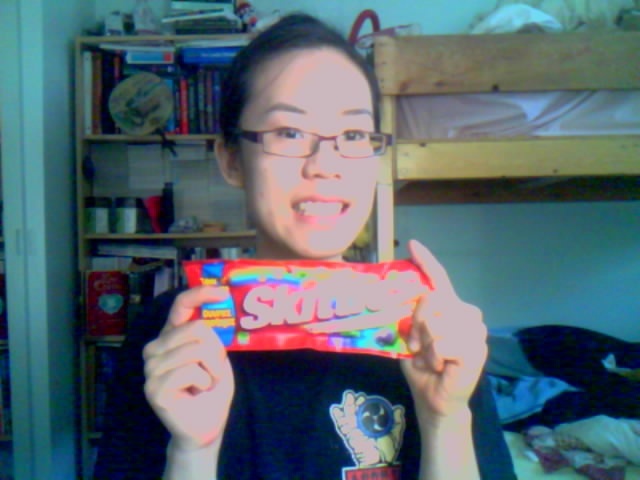 So I’ll just leave a photo of me about to taste the rainbow.